Researchers have long known that alcoholics in recovery face a lengthy period of sleep disruption, but some latest work out of the University of Melbourne suggests that a history of alcoholism can negatively affect sleep quality for as long as 2 years after achieving abstinence. Sleep researchers out of the University of Melbourne hooked 84 people up to a polysomnograph to evaluate the quality of their sleep. 42 of these study subjects were recovering alcoholics recruited from a residential treatment facility and 42 were non alcoholic control subjects. The average age of the alcoholic subjects was 49 (27 men and 15 women). Male alcoholics had consumed an average lifetime alcohol quantity of 1607.2 kilograms of pure alcohol and women had consumed an average of 847 kgs. Male alcoholics spent an average of 6.6% of sleep time in deep wave sleep compared to control males that spent 12% in deep wave sleep. Women alcoholics spent 11.1% compared to control women who spent 12.1%. Male alcoholics had more stage one rapid eye movement sleep (NREM) at 8.5% of total sleep time compared to control males who spent 6.2% in this sleep stage. Women alcoholics spent 6.3% of sleep in this stage, compared to 5.6% amongst control women. Alcoholics that had consumed more alcohol over their drinking career had greater sleep deficits. More time spent in NREM and less deep wave sleep are 2 factors associated with reduced sleep quality. The researchers investigated alcoholics that had been in recovery for as long as 719 days, and were surprised by the persistence of the sleep detriments. Drinking a large quantity of alcohol in a sitting reduces the amount of necessary REM sleep that night. The body makes up for this deficit by “rebounding” the following night with increased REM sleep time, to catch-up with what was missed. 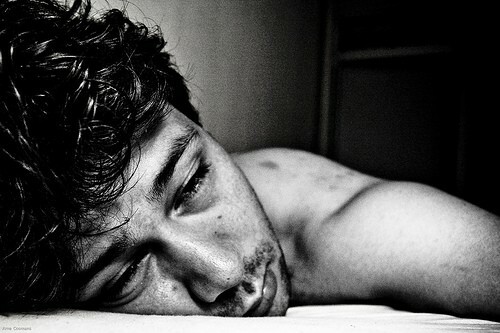 This catch-up theory of REM sleep has been used to explain the sleep disturbances of early alcoholism recovery, but the researchers say that the duration of sleep disturbances observed in this experiment (for as long as 2 years after abstinence) suggests that a more permanent structural change in the brain accounts for the changes in sleep patterns. The researchers say that these sleep problems may account for some of the cognitive deficits experienced by alcoholics in recovery. The research summary can be found in the Oct. 2009 edition of the journal, Sleep.